From left: Chief Rhonda Larrabee of Qayqayt First Nation, Melanie Mark, Minister of Advanced Education, Skills and Training, JIBC President and CEO Michel Tarko, Tina Dion, Vice-Chair, JIBC Board of Governors, Judy Darcy, New Westminster MLA and Minister of Mental Health and Addictions, and New Westminster Coun. Bill Harper, cutting cake marking JIBC's 40th birthday. 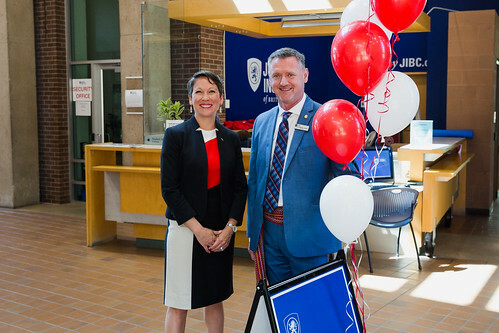 The Justice Institute of British Columbia (JIBC) is celebrating its 40th anniversary this year with an open house and career fair at its New Westminster campus today, the first of several events to mark the occasion. Melanie Mark, Minister of Advanced Education, Skills and Training, checks out the radio on JIBC's newest fire truck at the open house held at its New Westminster campus. JIBC was established in 1978 as a provincial institute with a provincial mandate to create a cooperative, collaborative model of educating and training public safety professionals in British Columbia. It was an innovative concept, bringing the training for several disciplines together under one roof. Initially, these comprised policing, corrections, courts and firefighting. Today, these areas of study have expanded to include sheriff training, paramedicine and emergency management. This has led to an environment where instructors from these different fields can exchange ideas related to interoperability, while recruits and students from a variety of disciplines have opportunities to interact. JIBC confers credentials that ladder from certificates into undergraduate diplomas and degrees as well as graduate programs in the areas of complex trauma and sexual abuse, and intelligence analysis. Minister of Advanced Education, Skills and Training Melanie Mark speaks at JIBC 40th Anniversary event. The evolution of JIBC has also led the Institute to develop expertise in other related and complementary fields, from search-and-rescue, conflict resolution and mediation, to counselling, leadership, and driver education. In turn, that experience teaching these skills makes JIBC uniquely qualified to train and educate other members of the general public in these areas. “At the heart of our learning model is a focus on experiential, scenario-based training. And as I watch students and recruits in policing, paramedicine, firefighting, the sheriff service and others practise how to respond to a wide range of real-life situations, I am constantly impressed by their dedication to service,” said Dr. Michel Tarko, JIBC President and CEO. Judy Darcy, Minister of Mental Health and Addictions and MLA for New Westminster, speaks at JIBC 40th anniversary event. The Institute’s expertise is recognized across Canada and around the world, a fact that has led to continual growth and success of its international education programming. JIBC is currently training paramedics in Hong Kong and Singapore, law enforcement professionals in China, and firefighters in the United Arab Emirates. Within Canada, JIBC’s reach includes training corrections staff in Nunavut and Indigenous firefighters in Quebec. The Institute also conducts applied research related to the professions it serves to make life and work better and safer for those involved. In its first 40 years, JIBC has had nearly 295,000 individuals enroll in its courses, of which more than 40,000 have graduated from its programs, both non-credentialed and those resulting in certificates, diplomas, baccalaureate degrees and graduate programs. In honour of JIBC’s 40th anniversary, The JIBC Foundation has launched the JIBC Future 40 Campaign to support students and is hosting the Be the One Gala on November 15, 2018. For more information on JIBC’s accomplishments in its first four decades, visit JIBC.ca/40years.